BELIZE CITY–The long awaited start of the Premier League of Belize Opening Season 2014-2015 finally took place without much fanfare over the weekend, with 3 of the 4 scheduled matches being played. The big opener, featuring defending champions Belmopan Bandits and sub-champions Police United on Saturday night at the Isidoro Beaton Stadium, was postponed due to weather, and will now be played this coming Wednesday night instead. Because of the late start of the season, and a CONCACAF requirement for two tournaments to be completed before a candidate for next year’s Champions League can be selected, the present Opening Season will have to be an abbreviated one. The addition of Wagiya and Placencia Assassins makes a total of 9 teams in this tournament, and for the first time in many years, the regular season will be a single round-robin, so each team will play only 8 regular season games, before the top 4 enter the home-and-away semifinals. The championship will also be a best-of-2 games series. 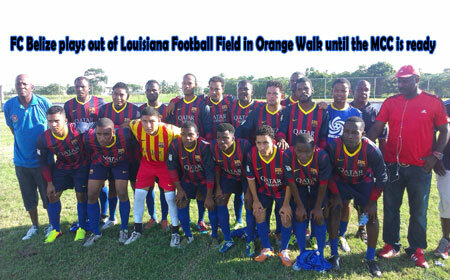 Belmopan Bandits were back to back champions in 2013-2014 and had earned a spot in the CONCACAF Champions League tournament, but the FFB Stadium field failed the CONCACAF inspection. Clubs are still hopeful that everything will be done to ensure no repeat of that disappointment next year. The champion of the Opening and Closing seasons with the best aggregate regular season record will earn the coveted berth in the 2015 Champions League. Three Week 1 games were played yesterday, Sunday. Down south at the Toledo Union Field, 2 first half goals allowed visiting Wagiya FC to come away with a 2-0 victory over home standing Paradise/Freedom Fighters. Shaking the net for Wagiya were Abraham Chavez (31’) and Hector Gomez (40’). Meanwhile, out west at the Norman Broaster Stadium in San Ignacio, it was Verdes FC taking the 4-2 win over San Ignacio United FC with goals from Ricardo “Cheety” Jimenez (19’), Nagib Guerra (45’) and Jarrett Davis (56’ & 87’). San Ignacio goals were by Joel Guzman (29’) and Julian Maldonado (81’). And up north at the People’s Stadium in Orange Walk, home team Belize Defence Force FC clipped FC Belize, 2-1, with goals from Vallan Symms (30’ PK) and Shane “Chucky” Flores (48’). The lone goal for FC Belize was by Oliver Hendricks (65’ PK). Placencia Assassins, who were resting in Week 1, will see their first action in Week 2 this coming weekend.